Today the story will be about the doll I’ve been working for quite a long time. She will be a fully costumed doll, with a unique face – in short, one of a kind. The work is going on in the scale a little bit larger than 1/6. I’ll make removable little clothes & boots for her, she’ll be able to change dress, please one’s eyes & pose for photoshoots – all that I love the doll world for. The costume & image will be the main topic of the next story, and now I’ll tell more about her face peculiarities. 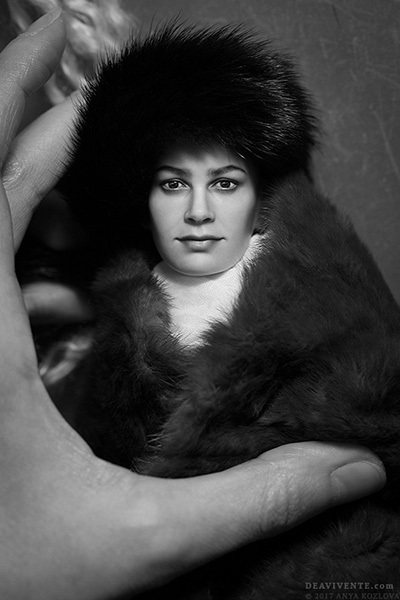 I’ll begin with that the prototype for this doll is a famous Soviet & Russian actress – Elina Bystritskaya. She is an extremely beautiful woman with special dignity, she has a noble face, charming smile & sparkling eyes. A well-informed reader will probably guess that the doll’s name is Aksinya, and I’ll clear this out that one of the most significant roles of Elina is a role of a Cossack woman, Aksinya Astakhova in a 1958 screen adaptation “And Quiet Flows the Don” of the same-titled novel. For this role she was approved by Mikhail Sholokhov – the author of the novel himself. 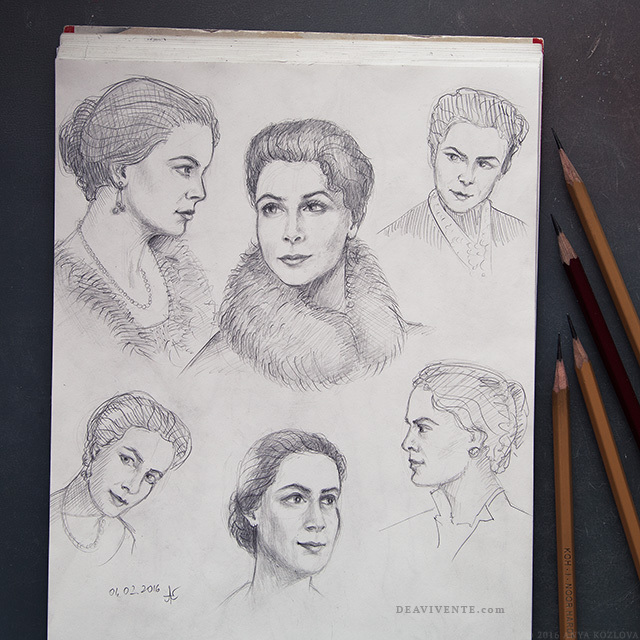 For a better understanding of the face’s features, I tried not to be in a hurry & have spent some time for research of available film & photo materials, as well as pencil sketches. Bystritskaya’s mysterious & calm smile became a special hard-to-catch enigma for me. It reflects her strong & forceful character, and by its modesty it highlights the actress’ dignity – as if she knows & keeps something inside that only a few knows. 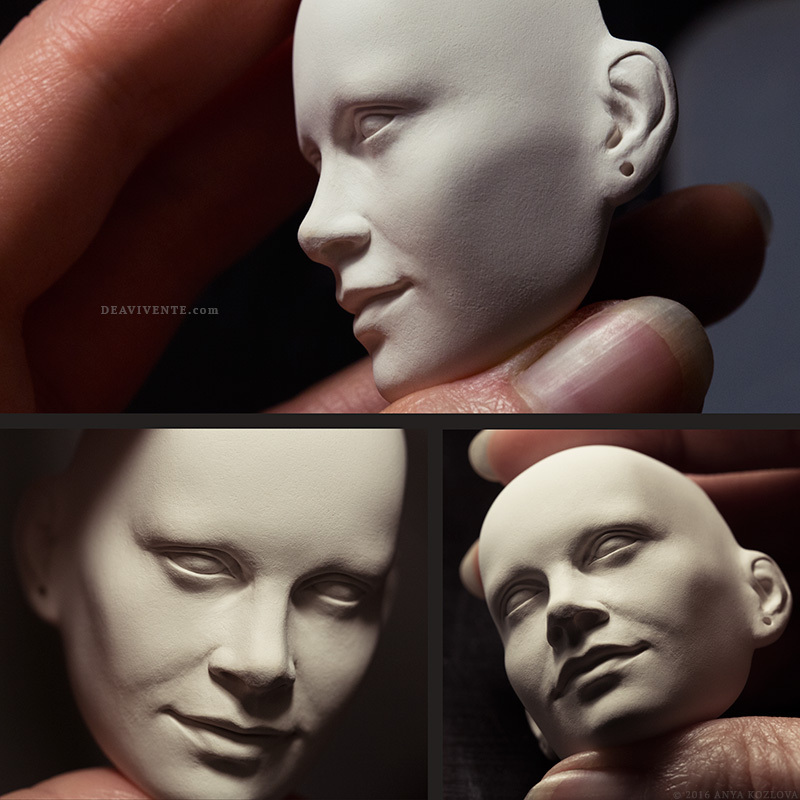 To embody a real alive face in miniature, I decided to come away from habitual doll-like image and to work in realistic style. To succeed in this effort, one need to observe certain conditions. 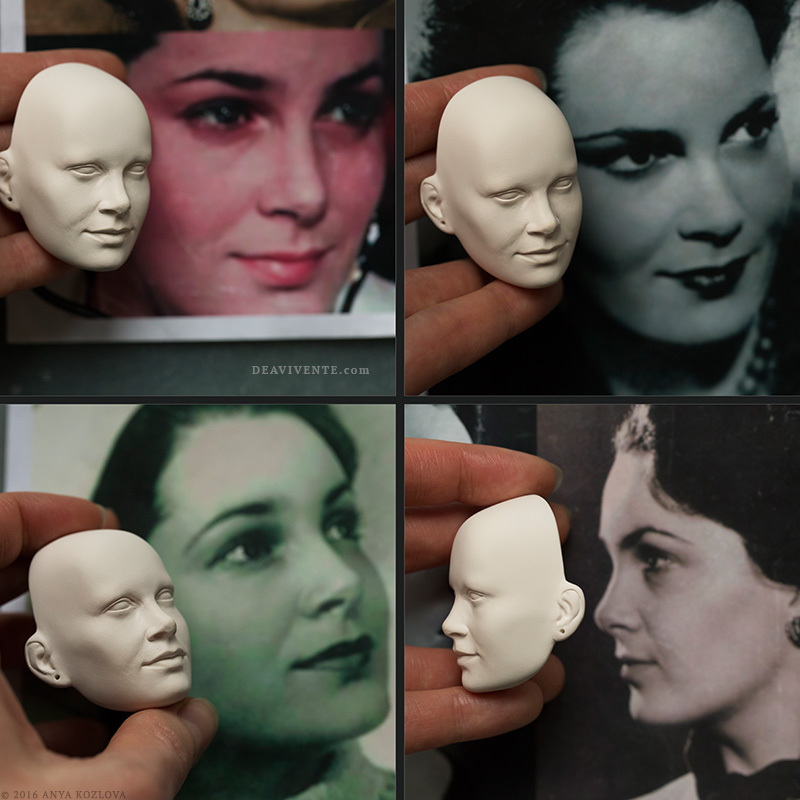 First of all, the sculpture of a porcelain cast should found the base, that is together with a special painting technique will give a desirable photographic effect of a real face. It needs to thoroughly work on & sculpt all the volumes, peculiarities of face features & outlines. To pay special attention to proportions of face parts, to keep in mind their visual perception from different view points. Besides, it’s important to keep & transmit anatomical peculiarities that are often omitted in artistic representations (for example, nasolabial folds or lacrimal grooves), but which are present in humans. Also, we may recall that a human face is not ideally symmetrical, and while standing at the mirror you’ll see different expressions if you close alternately right and left sides of your face with your hand. To understand and embody features, I was basing on photographs that, in my mind, reflect unique face characteristics better. 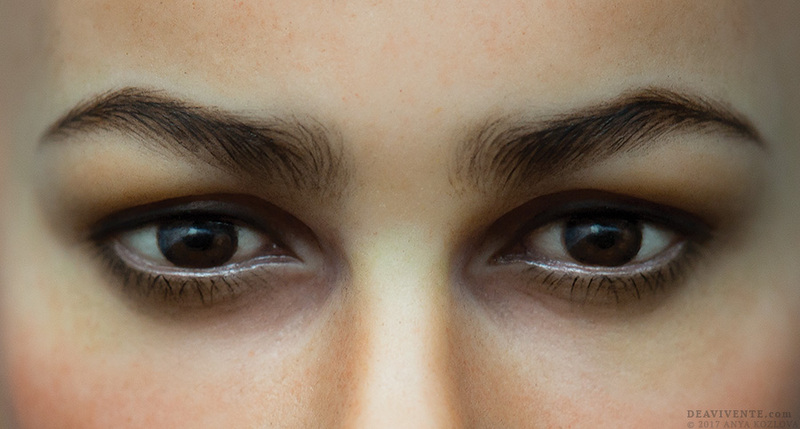 To achieve hyperrealistic texture I used multi-tone, multi-layer painting technique: here I draw pores, imitate uneven coloring of human skin & highlight its imperfections. The following macro photo captures the fragment of the face that is about 16 mm (5/8″) in height. To bring the forethought vision to life it took me 8 painting layers. The process is slowing significantly due to the need in firing many additional test pieces – to control tints & to check the colours & synergy of mixed paints after firing. But the result really pays off. With each layer the face is slowly coming to life, gathering details, beginning to show its character. And then at some point not you, but your doll begins to gaze at you. This process inspires & captivates me sky high each time I work with paints & brushes. 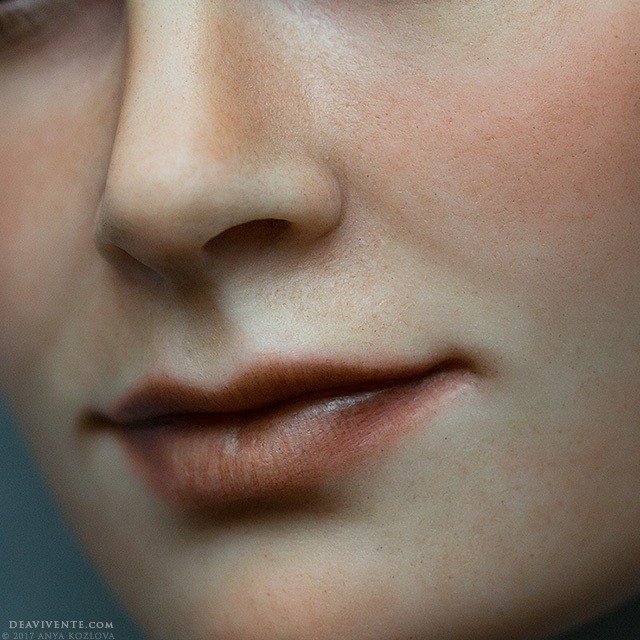 Realism of sculpture & the porcelain’s special texture, completed by the uneven painting with subtle transparent layers allow to achieve resemblance of macro photographs of the doll face with photographs of a real human. But the only difference is that this human is just 33 cm (13”) tall. The doll’s eyes are a very significant element to me – I was craving to embody a profound and penetrant gaze looking into the soul. They say the eyes are the window to the soul. Given that one embodies eye-balls in sculpture correctly & precisely, magic with painting will work out, and then the eyes will spark & the face will come to life. 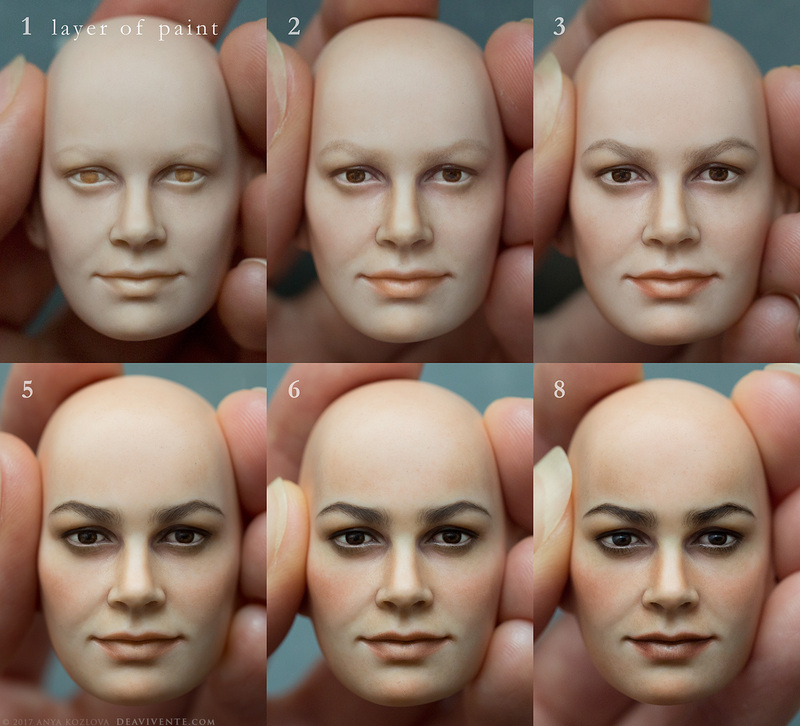 Realistic technique in small scale demands precise rendering in painting thinnest single hairs of eyebrows & lashes, lip wrinkles. When my eyes are not sufficient, I use optics to ease my work. The eye iris diameter is just 2 mm, shown in the photo below. I’ve owned some samples of fur for a long time & they were left unused until recently when I decided to apply them while making the New Year greeting card. This experiment has grown into a small photo-session in “à la russe” style. Now when Aksinya’s face is finished, I’m setting off on a captivating journey with fabrics, laces & beads! 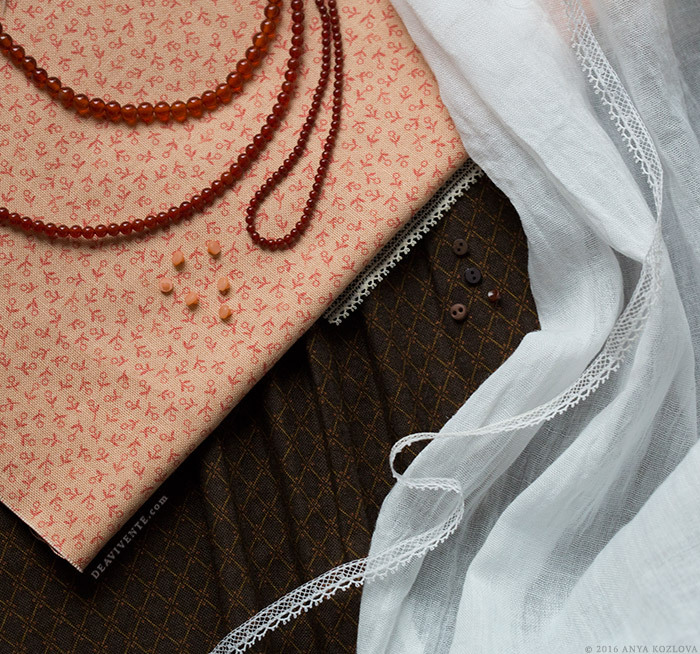 Here are some samples of materials I’m going to use for the costume. More photos in good quality can be seen in my gallery at Flickr. 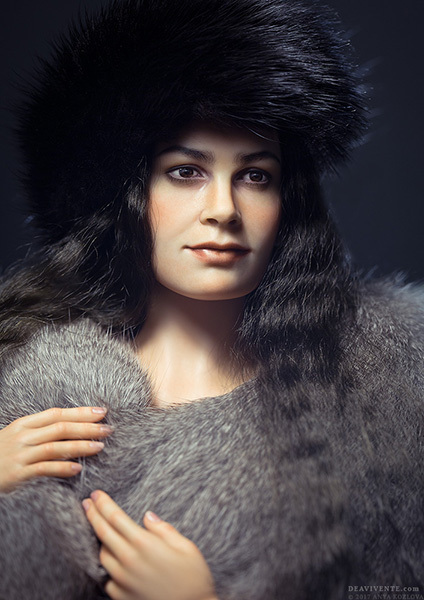 This entry was posted in New dolls, Work in progress, Костюмированные куклы. Bookmark the permalink.